1 How to Complete Amazon Customer Identification? 3 How to Get your Aadhaar Card Number for Verification? 4. Click on Continue for Amazon Customer Identification. Thank you for providing your Officially valid ID. You have completed your Customer Verification successfully with Amazon Pay balance. Shop Now. How to Get your Aadhaar Card Number for Verification? 1 . Click Here and you’ll get a screen as shown below. 2. Now enter your Name, Email ID or Mobile Number. 3. You’ll get OTP over Email ID if you enter your email ID else on Mobile Number. 4. Now enter the OTP. 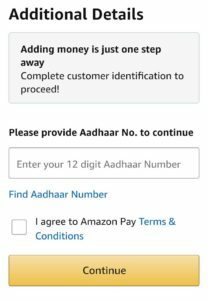 Now you can use this Aadhaar Number for Amazon Customer Identification. Are you confused with so many Amazon Load Money and Amazon Gift Card Offers? Don’t worry, we are here to help you. We will suggest you best offer for you, as in this post we will add all the on-going Amazon Pay Balance Load Money and Amazon Gift Card Offers. Nowadays, Amazon is conducting Amazon Quiz frequently and to keep all of you up-to-date, dealnloot team is back with Amazon Quiz Answers Today Contest Answer List post. We will post all the answers of All Live Amazon Quizzes, like Amazon Pay Quiz, Recharge Quiz, Gift Card Quiz, Amazon Quiz Winners list too. All of us know that Amazon keeps on conducting Amazon Quiz continuously, and dealnloot team always add Amazon Contest Answers. Now we are adding all Winners of Amazon Quiz Contest. Thanks for the information. I have done with my account on Amazon.in.